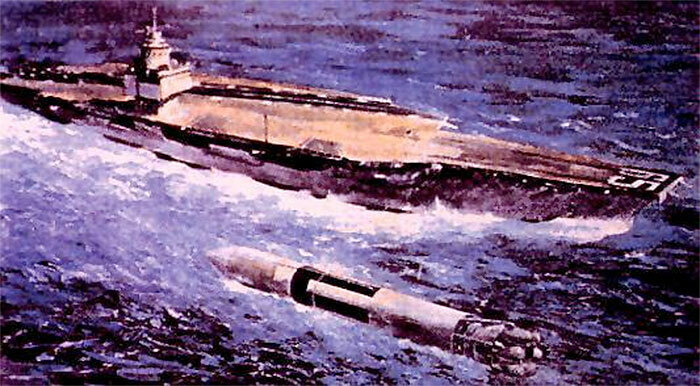 Truax proposed a rocket that was capable of placing 1.1 million pounds (550 metric tons) into a 306 nautical-mile circular orbit — about four times the payload of a Saturn V. With a gross liftoff weight of 40 million pounds, Sea Dragon was so large that it could not be launched on land but would have to be towed out to sea. (An advantage, in Truax’s view, since it would eliminate the construction of an expensive shore-based launch concept.) The rocket itself was 75 feet in diameter and 500 feet tall, not including the ballast platform needed to launch it at sea. A capsule and escape tower would have added another 50 feet. To reduce costs, Truax proposed the use of relatively simple technologies. Turbopumps were eliminated in favor of pressure-fed engines. Each stage had only one engine. Propellants were similar to the Saturn V. First-stage propulsion was an RP-1 kerosene / liquid-oxygen engine with 80 million pounds of thrust — 50 times the size of the F-1 engine used on the Saturn first stage. Second-stage propulsion was a liquid-hydrogen / liquid-oxygen with 14.12 million pound— 60 times the size of the J-2 engine used on the Saturn’s upper stage. These would have been the largest RP-1 and LH2 engines ever built, by far. The drawing below shows a Sea Dragon and Saturn V to scale. Truax was an advocate of strong structures with very large design margins to reduce costs. Aerojet proposed building Sea Dragon in a shipyard, using shipyard materials rather than expensive aerospace materials. This low-cost industrial approach to manufacturing became an anthem for later engineers who formed a school of rocket design called “big dumb booster” (BDB) or “minimal cost design” (MCD). According to BDB/MCD advocates, the way to reduce launch costs is not to reuse hardware but to build very simple expendable hardware with large margins that can be mass-produced at low cost. These ideas are enshrined in the book in the book LEO on the Cheap by Lt. Col. John London (USAF-ret. ), which has become something of a bible for BDB/MCD designers. Here’s where Truax diverged from his later disciples, because Truax did not advocate mass producing large numbers of Sea Dragons and throwing them away. He recognized that low launch costs would require reusing hardware. Sea Dragon was intended to reenter passively, using giant air bags to help decelerate it, and splash down at sea for recovery and reuse. This is an important aspect of the design which BDB/MCD designers rarely mention when they cite the Sea Dragon study as a design precedent. There’s another problem with the Sea Dragon study, however, which the BDB/MCD school has failed to notice. No one seems to have looked closely at the engineering economics of Sea Dragon. The numbers in the design study show that it would not have been as cheap as the legend claims. In general, the study has confirmed that large, simple, recoverable vehicles can be highly effective from a cost standpoint. A total system development cost of $2.836 billion is forecast. The direct flight related cost is $10 to $20 per pound of payload. Amortizing the research and development cost over 240 flights gives a total cost effectiveness of $20 to $30 per pound of payload. No elements of the original concept have been shown to be technically unfeasible; how- ever, the technical feasibility of a completely passive recovery system has not been demonstrated. Here’s where the study falls down. Aerojet General amortized the R&D costs over 240 flights, which it assumed would occur over a 10- to 20-year period at a rate of 12-24 flights per year. Unfortunately, they amortized by simply dividing the total cost by 240 and forgot to include the cost of money. Ten to twenty years is a long period to amortize over, and interest over that period of time would be significant. Even if Sea Dragon was built as a government project, as was intended, interest cannot be ignored. The project must “borrow” money from the government treasury, which needs to be accounted for and repaid at the prime rate. Prime borrowing represents an artificially low interest rate, however, which does not reflect the degree of risk inherent in an aerospace project. Government projects can get away with that because they simply transfer the risk, invisibly, to the taxpayers. That’s called “funny accounting.” Private investors, however, won’t let a project get away with that. As a rule of thumb, they expect an internal rate of return (IRR) of at least 50% for a risky project like this. That means a $21.55 billion must generate an annual return of $10.78 billion to pay back the initial investment and compensate investors for the risks they have taken. That’s equivalent to $449 million per flight, based on 24 flights per year, or $898 million per flight, based on 12 flights per year. This adds $408 per pound to the launch costs, based on 24 flights per year, or $816 per pound, based on 12 flights per year. So, the total launch costs would be $483-558 per pound, based on 24 flights per year, or $891-996 per pound, based on 12 flights per year. That’s significantly more than the $150-300 per pound which the original study predicts. Here’s where the study really falls down. Even 12 flights per year is an unrealistic launch rate for a vehicle this big. That’s the equivalent of 48 Saturn V missions per year. At the height of the Apollo program, NASA never launched more than two Saturn V missions per year. The Sea Dragon study was predicated on a very large government Mars program, which never materialized (and frankly, was never in the cards). To put it into modern terms, the entire International Space Station has a mass of just under 1,000,000 pounds. Sea Dragon would have to launch the equivalent of 12 International Space Stations per year just to meet the lower bar. There is not enough demand to sustain Sea Dragon, even at the lower launch rate. And if the target launch rate of 12 flights per year is not met, the economics get much worse. Based on six flights per year, the costs go to $1,707-1,782 per pound. Based on four flights per year, costs to $2,574-2,599 per pound. Even four to six flights per year might be optimistic, given the total world demand for launches. Big Dumb Booster enthusiasts will point out that demand can be expected increase, once a lower-cost launch system is available. That’s true, but the increase will not be instantaneous. There will be a time lag, as new payloads and markets are developed to take advantage of the lower launch costs. That’s especially true for government payloads, which must go through a lengthy political funding cycle. The investment clock does not stop ticking, however. The cost of money continues to grow, even as investors wait for new markets to develop. Sea Dragon suffers from what Max Hunter, another old-time rocket pioneer, called “the tyranny of trivial flight rates.” Even the highly optimistic 24 flights per year which Aerojet hoped for are not enough to efficiently utilize a reusable vehicle. The economics of reusable vehicles really demand hundreds, preferably thousands, or flights per year. Such flight rates are not compatible with million-pound payloads, now or any time in the near or medium-distant future. For anyone who’s interested in learning about the technical details of the Sea Dragon, two volumes of the original design study are available from the NASA Technical Report Server. Volume I can be downloaded here. Volume III is here. Volume II is apparently lost. I found this article very interesting. Like most I followed the news on NASA during the 60’s and 70’s but did not get directly involved until 1982 when I worked on the seat design and manufacture. That contact showed me how fast costs can escalate from the design to the actual finished manufactured costs. I continued to work on various NASA projects thru out the 80’s and into the early 90’s. In all cases manufactured costs far exceeded those listed in the initial design package. These increases where caused by many factors but in all instances the cost still increased. This is an interesting article, and your point about the cost of money is very well taken — however, I think you’re way off base in suggesting that a 50% IRR would be required for a project like this. 50% is the sort of IRR that VCs look for when they invest. This kind of IRR is only ever undertaken in the context of a broad portfolio of risky investments. The assumption is that 90% of their investments will fail, 9% will be low performers, and 1% will turn into multi-billion-dollar companies. In other words, if you have an investment opportunity with a substantial risk of failure, you seek a high IRR, and hedge your bets by also making other investments with uncorrelated (or anti-correlated) risks. On the other hand, if you have an investment opportunity which does *not* have a substantial risk of failure, then you don’t need to seek a high IRR. Seeking a high IRR from a single, un-hedged, high-risk project is something that simply isn’t done. For a mega-project like Sea Dragon, the finance would be structured into a number of different stages. The highest-risk elements — which could potentially cause the project to outright fail — would have to be financed with a relatively high IRR. But as those risks are retired, the required IRRs for the subsequent stages of investment and/or lending would fall dramatically. By the time you got around to the second $10B of the development programme, there should be very very little risk of project failure, and so the IRRs or interest rates would likely have fallen to somewhere around 6%-10%. Together, all these different sources of capital would form the “Weighted Average Cost of Capital” (WACC), which is the dictates the IRR that you need to meet. I’d be very surprised if the WACC for something like Sea Dragon came to more than 25%. This has fairly substantial implications for the launch costs. The rest of your points are entirely valid, and I don’t think this would fundamentally change the argument that you make. But it does change the numbers pretty dramatically. Thank you for making this point. I am so tired of people taking the “we need heavy lift for current payloads” statement as a truism. If medium or light lift become significantly cheaper due to reusable vehicles, payloads will adapt to take advantage; whether it be through swarming, lower orbit constellations, or on-orbit assembly and refueling.